This is a central question to which you should get an answer before you sign up for a trip. Even if you don't know any of the guides in a particular guide service, most of these services publish, as part of their advertising, a list of their guides. The service should state such information as years of experience, guiding credentials and other potentially useful information. Ask the guide service who your guide will be and make sure they are UIAGM/IFMGA certified. This certification required by federal law in all European countries in order to work as professional guide. It is advantageous to have a local, preferably native, mountain guide as he/she knows the locals, speaks the native language and has all insider information to benefit your trip. 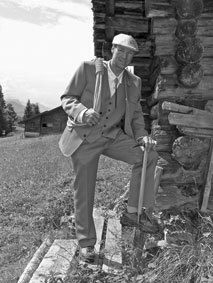 Swiss mountain guides specifically are required to speak several languages, which certainly gives them an advantage over foreign guides. Consider hiring a local guide, who knows the area and conditions first hand. A local guide can offer alternatives and has a higher changes to get you to the summit including a higher margin of safety because of local knowledge. When you contact a guide service about a trip, be sure to ask who is likely to be your guide. The staff of most guide services includes a range of experience and qualification levels among their guides. Because of scheduling constraints and sign-up uncertainties, it may be difficult to get an clear answer to your question from the guide service, but in order to avoid getting the least experienced, you should press for concrete information about your guide. The published material describing staff can sometimes be unclear who is the best. Read the section down below on Qualifications and Training for more information. Ask if the guide speaks English well and is accustomed to the culture of the guests. Find out if he /she can speak the local language and communicate in the language where you plan your trip. 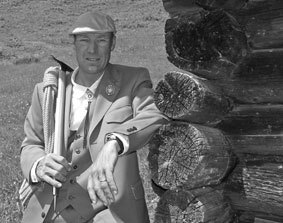 If you know of a specific guide, perhaps you have heard good things about a particular guide or maybe you had a great previous trip with that guide, request him or her. Make every effort to convince whoever does the scheduling to guarantee your guide of choice. If you have a favorite guide, but that guide is not available, ask for a recommendation for another guide. If possible get the recommendation from your favorite guide or someone else you trust. Someone with whom you have developed a personal relationship is more likely to keep your interests at heart in making a recommendation. Be suspicious if they can't recommend you to someone else. Ask why. In some cases there may be no one else the guide can honestly recommend. Usually though, most good guides have good relationships with their competitors. If they recommend you to a competitor, that speaks well of both the guide doing the recommending and of the competitor. The main thing to remember is that you are going to spend a significant amount of time and money on an outing with a guide, so, first, shop for the guide, then the guide service. In Switzerland and all European countries, International Federation of Mountain Guides Associations (IFMGA) is the certification body. The certification is the license to guide in the IFMGA countries. Liability insurance exceeding 10 Million Swiss francs is required in order to guide legally. Ask for a properly insured guide. In Switzerland each state has all licensed and insured guides listed on the Swiss Guides Association website www.4000plus.ch. Additionally, there is a poster with the current licensed guides of each Kanton (state) in all the huts. All Swiss guides have to attend a refresher course every other year to maintain a current license. Foreign guides have to register (if guiding over 10 days during a season) with the local Swiss governing body to guide legally. Ask your foreign (non-Swiss) guide if they have such a document. It might save you an unfortunate situation, for example, if your guide gets escorted off the mountain, and you are stranded without a guide. It is surprising but true that in the United States climbing guides don't need any type of official guide training or certification to guide. However, there are internationally certified American guides and a small handful of guide services (and they are not any of the large ones) require their guides to be certified by the American Mountain Guides Association (AMGA). Therefore, if you are seeking an AMGA internationally certified guide, you can find a listing of those guides on the AMGA web site. 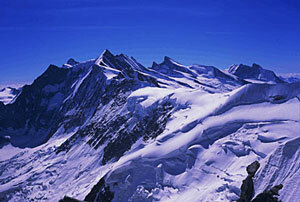 It is interesting to note that the Swiss mountain guide (SBV) training is the standard in the world of certified guides. All surrounding nations such as France, Germany and Austria are copying and restructuring their programs in accordance to the Swiss module program. Roughly 1350 qualified mountain guides are members of the Swiss Mountain Guides' Association, 1% of whom are women. All are professional leaders in mountaineering, climbing, trekking, skiing and snowboarding tours who enable their customers to experience the mountains and natural environment. They are trained to ensure that tours are prepared and conducted in a professional manner, with special regard to safety. They have extensive knowledge and practical skills. A successful mountain guide needs to be open, friendly, responsible and both physically and mentally resilient. Only those who have many years experience in the mountains and who have successfully completed the demanding training course may work under the title of "Mountain Guide with Confederation Certificate". This normally consists of a three-year training course which is subsequently completed by professional on-the-job training. 1st year of training: "Course for aspiring mountain guides". 2nd and 3rd year of training: "Guided tours under the supervision of a qualified mountain guide". The Swiss Mountain Guides Association delegates the organization of courses, on a rotation basis and for the whole of Switzerland, to one of the three regional associations: Berne, Graubünden and Valais. 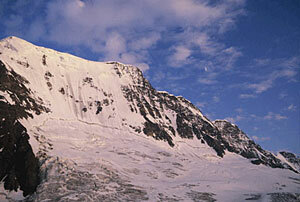 A course for aspiring mountain guides and a professional master’s course are held every year. My advice is to seek a guide who you know to have received specific and formal training in being a certified guide through the international mountain guides association IFMGA. Look for a guide who has passed that association's certification exams. In Switzerland we can have an assistant guide "Aspirant" with a group under direct supervision of a IFMGA guide. Be sure that the Aspirant is trained and certified in the basic discipline of your planned activity, either Rock, Alpine or Ski (look in the SBV web site). Get a guide that speaks English and the native language well, so he or she can give you the maximum cultural experience. First, is safety. In mountainous terrain a small team moves much faster, avoiding all the bad things you like to avoid, like afternoon thunderstorms, nightfall, exposure to objective hazards, icefall, rock fall, avalanches, hypothermia and others unpleasantries. Mountaineering and guiding history is littered with stories of large rope teams falling together. Whymper's tragic climb of the Matterhorn where 4 out of 7 climbers roped together fell to their deaths is a classic example. Whymper and the Taugwalders were spared only because the rope broke! Today, Swiss guides will only take one client per guide up this peak. On easy glaciated peaks or technically easy climbs, larger groups may be desirable. These groups offer greater social interaction and the increased party size can give strength to a rescue or other potential problem. But don't confuse party size with guide to client ratio. Even in a large group, try to go with a low ratio. Unfortunately, many guides and guide services go for the extra dollars or the more competitive pricing that trips with high ratios can produce, sacrificing safety or the quality of the experience in the process. A large roped party, traveling on exposed terrain, is exposed to the clumsiness of its weakest member. A good guide with fewer people on his or her rope will have at their disposal more, and more effective, methods of protecting the party. Large parties sometimes use running belays (the entire rope is moving, with the leader occasionally placing anchors through which all team members successively clip) on moderate but exposed terrain. This is a common practice on long snow slopes. In my opinion, this is often a red flag indicating that the party may too large for the objective. An entire falling rope team puts incredible stresses on the one or two anchors holding it to the mountainside. Often these anchors are snow pickets or other types of snow anchors which are dubious at best. Speed and a greater range of available techniques the guide can employ are what makes the small ratio safer than the large. Small teams generally move faster than large teams. This means you spend less time waiting for others, stay warmer, and have more time to spare at the end of the day, relishing your accomplishments. Small teams also have more inherent flexibility to accommodate adjustments in team composition. Compare a group with 2 guides and 4 clients to another group with 2 guides and 6 clients. If one of the climbers is ill or simply doesn't have the strength, will or desire to continue, with the 2:1 ratio one guide can take the healthy client, in addition to his or her other clients, on his or her rope and continue to the summit while the other guide heads down with the single client. In the 1:3 ratio, however, the guide going on to the summit may be unable to accommodate the healthy clients from the other rope. In this situation one or perhaps two perfectly capable climbers will be unable to summit because the higher ratios lacked the flexibility to adjust. Smaller ratios generally offer greater rates of summit success. In instructional settings, courses with a low client to guide ratio give each participant greater personal attention. When shopping for a trip always inquire what the maximum client to guide ratio will be. In general, technical climbs should have a maximum ratio of 2:1, and climbs with a great degree of exposed 3rd and 4th class terrain, such as the Matterhorn or the Eiger should be done at a 1:1 ratio. Low angle glacier climbs can be done at higher ratios, but more than 4 - 8 people on one rope can be a frustrating experience for everyone. Low ratios are generally more expensive, but the increase in safety and the greater chance of summit success normally make them well worth the extra cost. Consider additional ancillary costs. Some guide services include just about everything you could imagine in their trip fees, others, precious little. It's hard to know what specific things to ask about. Generally a good sign, however, is if the guide service can give you definitive answers to any of your questions regarding what is covered. The more you ask around the better sense you'll get. Yet another consideration is what equipment is supplied with the trip. Most guide services can rent you gear if you need it, but the price varies greatly from guide service to guide service. Other, more generous services, will lend you gear you might need. The quality of accommodation both in tents and hotels that a guide service offers can greatly affect the cost of the trip. The star system for comparing hotels is a good indicator of the type of lodging you'll be using. If the cost of lodging is included in the trip you might want to ask about these things. There are a number of different credentials you might come across in your search for a guide or guide service. First, a few definitions. Certification programs are offered by the Schweizer Bergführer Verband (SBV), which is the Swiss mountain guides association and the American mountain guides association (AMGA). The International Federation of Mountain Guide Associations (IFMGA) and the Union International des Associations de Guides de Montagne (UIAGM) are one and the same, the former merely being the English translation of the latter. As the name would suggest, the IFMGA is a federation of member guide associations. There are 18 different member associations, including; Austria, Canada, France, Germany, Great Britain, Italy (Italy has 3 different associations), Japan, New Zealand, Norway, Peru, Poland, Slovakia, Slovenia, Spain, Sweden, Switzerland and the USA. In November 1997 the US became a fully qualified member of the UIAGM. The 16 member countries of the IFMGA all have agreed to recognize the training and certification programs of the other member countries. In so doing they try to offer to one another reciprocal rights of access to guides. It is because of the IFMGA that guides certified by the member associations can ply their trade with a minimum of red tape in other member counties. All member associations have guide training programs which have been inspected and approved by representatives from the IFMGA. These training and assessment programs produce guides who are called IFMGA (or UIAGM) Mountain Guides. If you ever travel to IFMGA countries you might see the guides with the little pewter and blue IFMGA guides pins. Only IFMGA Mountain Guides are permitted to display this IFMGA logo. In all IFMGA countries guides must be certified IFMGA Mountain Guides to legally guide commercially. If I were shopping for a guide I would look for the logo of the Schweizer Bergführer Verband SBV (below center) and the American Mountain Guides Association (far right) with the word CERTIFIED on it. Only SBV, AMGA certified guides members are legally permitted to use the logos, and they must display the necessary explanatory text, such as Certified. If you are planning a trip to a UIAGM member country including all of the Alpine countries in Europe, Canada, New Zealand or Peru, you should seek out a UIAGM (IFMGA) Mountain Guide to be sure of the legality of their commercial operation there.